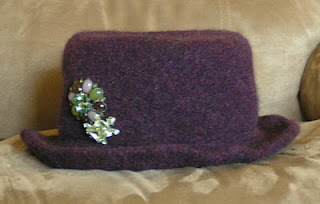 So, you know that I knit, crochet, sew a bit, all kinds of other things - but until recently I've never felted. It's kind of fun! Of course, I did something incredibly easy but still it was neat. Yes - it's a purple top hat. I made it in homor of Order of the Phoenix member Dedalus Diggle. For now it's got the pins on it for decoration, but I'm planning on making some interchangeable bands and pins - I have a great idea for ostrich plumes, tulle, and lily petals. As soon as it was pulled out of the washer, though, the weather got very springlike and warm so I won't be wearing it for awhile. That's okay. I think the girl child wants one, too. I've been knitting on the Evenstar shawl. It's turning out great. I've finished clue one and am starting clue two - but it's on hold for a couple of days while I knit on a pair of mitts for Cylon War with my Battlestar Galactica group. The pattern came out today and a couple of people are already done with the first one. I need to get myself in gear or I'll get toasted by a toaster! It's a great pattern - I'm glad I'll be getting a pair! They'll have to wait until cooler weather, too, though. This week the kids are on spring break. I hope the weather stays nice so they can play outside and I can work in the yard a bit. It will be a very long vacation if we're stuck inside together!